Last Operations Officers (Ia) of the 21 by Stalingrad trapped German divisions. (Last) Operations Officers (Ia) of the 21 by Stalingrad trapped German divisions. Oberst i.G. Günther Breithaupt, Ia Officer of the 76. Infanterie Division. The 76. 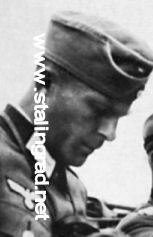 Infanterie Division, under command of Generalleutnant Carl Rodenburg, was trapped in the Stalingrad encirclement. Oberst i. G. Günther Breithaupt died in Russian captivity. Picture : courtesey of the Breithaupt family. The picture is copyright protected. Please respect the copyright. What's an Ia Officer ? The Ia (chief-of-staff), usually holding the rank of Oberstleutnant i.G. 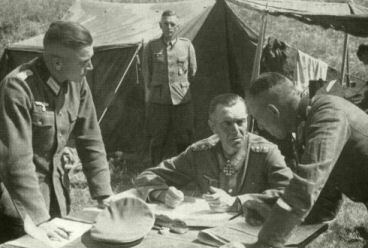 (im Generalstab), was the 1st General Staff officer of the division. remain at the command post to stand in for the division commander. air-raid protection, evaluation of experience etc. and only candidates that were in the top 1% were considered. Picture : courtesey of Rainer Lehmann. The picture is copyright protected. Please respect the copyright. General staff training was in three stages. The first stage was "on-the-job"
knowledge of all types of military operations necessary for good staff work. to teach the trainee to lead a division in combat. In peacetime, all three stages of general staff training took two years to complete. experience before they attended the college. commander in all situations, and - if need be - to take command of the division. Born 8 August 1904 in Freiberg. Born on 29 April 1919 in Hochdorf. "pocket" on 31 January 1943. Born in Reval on 23 September 1906. 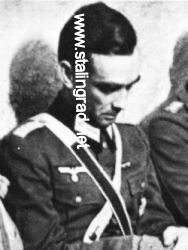 Died in Niederfüllbach on 12 July 1973.
labor camp on 16 Janaury 1956. Almost 13 years after he was captured. Born in Bischwitz on 31 August 1908.
explosion of a Russian bomb. suicide on 2 February 1943. Born in Berlin on 28 October 1911. 1943. Declared dead on 8 July 1952. Major von Berg (O1) did his work. out of the Stalingrad "pocket". Born in Colmar on 23 November 1904.
promoted Oberst on 1 January 1945! Born on 3 October 1905 in Jargelin. promoted Oberst on 1 August 1944. Released by the Russian late 1955. Died in Bonn in 1979. Last Ia of the A.O.K. 6. Born on 14 July 1905 in Ballstädt. January 1943 in the central "pocket"
the "pocket" also on 9 Janaury 1943. Schwanbeck was with this Staff. Frankfurt am Main on 30 January 1990. He flew out of the Stalingrad "pocket"
94. I.D. were attached to other divisions. 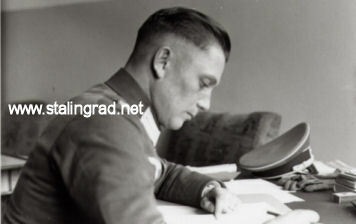 Born in Schmalkalden on 25 June 1907. Died in Blankenstein on 17 October 1967. Stalingrad on 31 January 1943.
near Stalingrad on 20 April 1943. 1943 in the northern Stalingrad "pocket"
during April 1963 in Wiesbaden. "pocket" of Stalingrad on 31 January 1943. 1955. Returned disabled from captivity. Stalingrad on 25 January 1943.
and was released. 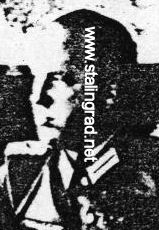 Still alive in 1978.
action at Stalingrad on 26 January 1943.
to break out of the Stalingrad pocket. Von Amsberg was not replaced as Ia. who was a good friend of Wilutzky. attached to the other encircled divisions. I would like to thank Jason Mark, Ronald M.A Hirst and Rainer Lehmann (www.privates-antiquariat.de) for their help completing this page. I also would like to thank several families of the former Ia Officers, especially the Breithaupt, von Menges and von Drabich-Waechter families for the beautiful pictures. Geert Rottiers, Belgium, 26 March 2003. Last updated 28 december 2011.